WEIGHT BEARING X-RAYS - The weightbearing foot series will usually be composed of a weightbearing DP foot radiograph and a weightbearing lateral foot radiograph with possible additional views as directed by an orthopaedic surgeon or if the radiographers need to highlight an area of pathology. 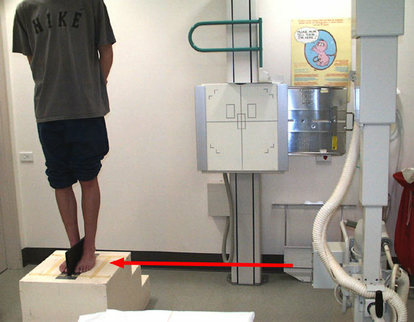 It is important that alignment is assessed using weightbearing radiographs because the functional position of the bones of the foot is needed, in other words, you can't see the damage unless you make the foot act as normal. Visiting from the A-Z. Sounds very painful, wish you quick healing. I whizzed through your dairy of your injury. I broke my wrist right before the 2014 A to Z. I know it took a good year to get my arm working again but it will never be the same (as you know.) Just an FYI -I have about 15 screws in different parts of my body and they have never set off the monitors at the airport. I never knew they did weight bearing xrays but that makes sense, to see how things are healing.